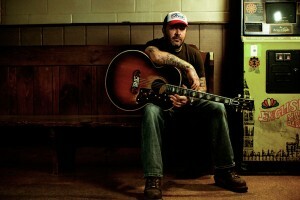 Country music comes naturally for Aaron Lewis. However, Lewis fully shows that spirit on his forthcoming five-song Town Line debut solo release for Nashville-based Stroudavarious Records and, most prevalently, via its first single, “Country Boy.” With a little help from legends Charlie Daniels and George Jones as well as genre stalwart Chris Young, Lewis tells his story like never before on the song. Debuting in December 2010, “Country Boy” serves as a fitting introduction to Town Line, which hits shelves in early 2011. Lewis’s voice carries a catchy chorus over a slide guitar, and he opens up about his past, present, and future. Featuring a fiery fiddle lead from Daniels, a booming verse from Jones and Young’s lilting harmonies, “Country Boy” strikes a balance between classic and modern country. “Country Boy” is simply the beginning though. As a whole, Town Line signals the next evolution for Lewis. He went back to his roots, and the results are as powerful and poignant as anything that he’s committed to tape. Growing up in rural Vermont, the singer/songwriter spent summers with his WWII veteran grandfather hunting and fishing. During that time, he developed a love for the land, the woods, and the simple life, which still permeates everything he does. There was one specific soundtrack to those times though. Listeners won’t be able to let go of the songs on Town Line either. Lewis recorded his latest offering in Nashville during early 2010, and it brandishes the singer’s trademark style and a distinct country soul. Produced by Grammy Award-winning James Stroud and Lewis, this collection proudly sits alongside Lewis’s numerous accolades. With Staind, he crafted the most-played rock song of the decade, “It’s Been Awhile,” sold 13 million albums worldwide, had four consecutive top 3 debuts on the Billboard 200, and released multiple cross-format radio hits. However, listeners haven’t heard him like this until now. That accompaniment seamlessly blends with Lewis’s unique voice. One song, “Massachusetts,” builds from a poetic visual of Lewis sitting on his front porch into a love letter for his home state. The song paints a vivid picture of the tranquility the singer still finds in the Northeast. Stroudavarious Records also proved the perfect home for this project. Lewis instantly bonded with producer and CEO James Stroud, and they’ve crafted something very special that goes even deeper than the songs. Ultimately, Lewis is giving listeners something that he always does. There’s a tangible honesty to each of these five songs, and he opens up with every guitar chord and lyric. This entry was posted in All Talent, National and tagged Country by admin. Bookmark the permalink.